Hydration is the number 1 rule of tan maintenance. If you let your skin become dry, it’ll start to flake away and you’ll soon be saying goodbye to your gorgeous golden complexion. Use a nourishing facial and body moisturiser or tailored After Sun to keep the skin radiant and plump. Our NUXE Sun After Sun lotion for face and body is specially designed to prolong your tan by up 2 weeks* by hydrating, helping to repair and soothing the skin. It uses a powerful combination of ingredients from natural origins including plant origin polyglycerides and carob seed powder. The polyglycerides have an emollient power contributing to optimize skin moisture which is essential after sun exposure. The natural carob seed powder helps to prolong and sublimate your tan. Hydrating the skin cells from the inside is just as important. Water is nature’s After Sun, increasing your daily intake of H20 will also help to keep your tanned skin hydrated and glowing. The daily recommended intake is 2L. Hot showers seriously dry out the skin, so go easy on the temperature to avoid flaking or peeling and resist the temptation to shower for too long. Shower gels can also be drying so stick to a more gentle shower gel such as our After Sun hair and body shampoo. It ensures gentle cleansing together with good foaming power. The cleansing base also helps condition hair, leaving it feeling soft and silky. Our After Sun shampoo contains Water Hyacinth clean without drying and Kau Pe flower to calm, smooth and refresh your skin from overheating. It’s still important to exfoliate as dull skin cells can dampen your holiday glow. Just make sure you go gently. Use a very gently body scrub in light circular motions on your arms and legs and then a gentle exfoliating gel on your face. Our Facial Exfoliating Gel with Rose Petals will help to dissolve away any dead skin in a gentle way. Follow this up with your refreshing Nuxe Sun After Sun lotion to keep the skin moisturised. Adding a touch of shimmer to the skin is an effective way to amplify any remaining tan and add a dose of extra glow. A shimmering body oil, such as our Shimmering Dry Oil Huile Prodigieuse helps to illuminate tanned skin with tiny golden particles whilst providing hydration. Now you’ve got your base layer, help to maintain it with the helping hand of the appropriate tanning oil or tanning lotion. 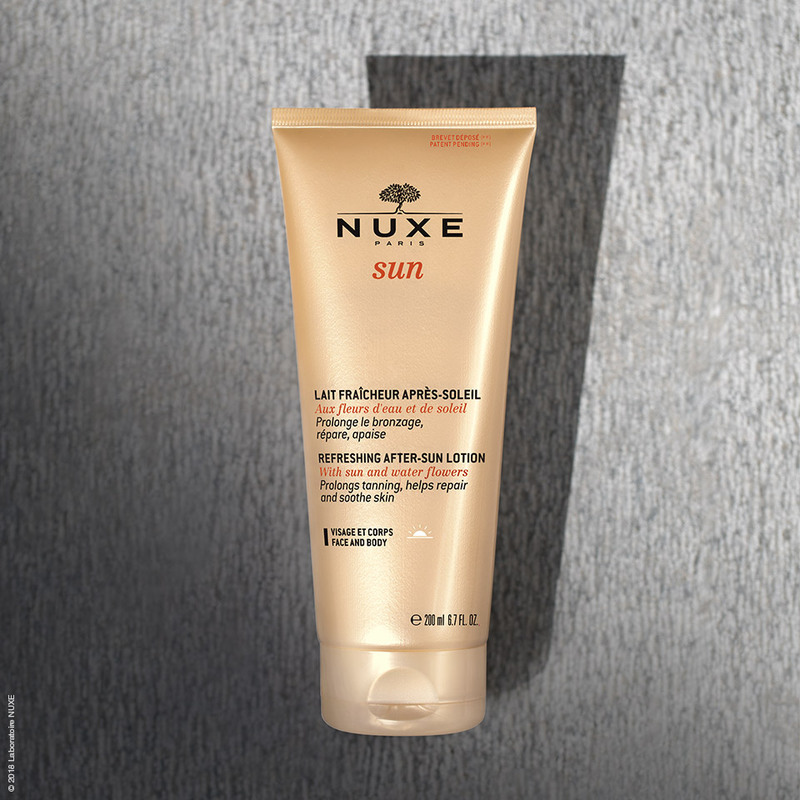 If you’re still spending some time outdoors, NUXE Sun tanning oil SPF 10 is ideal for darker skins looking for a low protection against the sun’s rays whilst encouraging a more intense and golden tan. If you’re spending prolonged time under the sun’s stronger rays or if you have a fair complexion, up the ante with NUXE Sun tanning oil SPF 30. Our sun tan oils have a beautiful non-greasy formula which keeps the skin soft and hydrated. Eat your way to bronzed skin? It’s true; foods loaded with beta-carotenes have been found to mimic the golden tones of a tan within the skin. Make sure you’re getting your fill of carrots, papaya, sweet potatoes, apricots and mangoes to reap the benefits. Shop the NUXE Sun Range and find the products to keep your tan glowing on the NUXE site here. *In vivo clinical test conducted on 14 volunteers using chromametry, 14 days after sun exposure.